Almost all stamps issued by Posta tal Musograd which are denominated in Common Wallaroo (CW) or bit (1 CW = 100b) can be ordered internationally through the philately department (philately@musograd.org) at face value, plus a handling and shipping charge of CW 5.00 per order. Selected stamps issued before the introduction of the CW will be made available soon, with the purchase price defined on this web site. 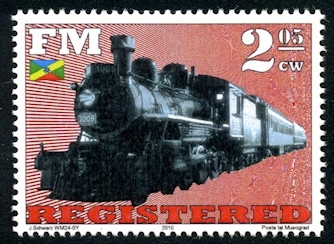 All valid stamps can be ordered mint or cancelled, with cancellations from Musograd City or Balangrad City. Stamps issued before the CW introduction 2008 can only be ordered mint, except for cases where cancelled stamps are on stock (designated by a separate order number appended with "C"). Posta tal Musograd has been granted a special Export Exchange Rate for payments in US$ and €, with both set at CW 1 = US$ 0.60 = 0.50 € = GBP 0.45 as of 2018.01.01. Payment is possible using Paypal and EU Bank Transfer. All export orders shipped to countries outside the Federated Micronations will be handled through yourstamps . Payment is due after receival of the stamps, except for large orders or selected countries, according to the yourstamps terms of service. Re-importing exported stamps into the F.M. is not allowed. To avoid re-importing issues (the current official exchange rate being CW 1 = 0.90 €), orders above CW 500.- may be subject to restrictions or an adjusted Export Exchange Rate. This does not apply to cancelled stamps. It is possible to make a Standing Order for all Posta tal Musograd issues, based on Year Sets. Standing Orders will be shipped once a year, usually in January for the stamps of the past year. An additional 10% discount is applied to the costs of the stamps. If the Year Set costs more than CW 25.-, the customers will be notified before shipping. We also offer "Bi-directional Standing Orders". With these, customers will receive the stamps of the current year, together with the stamps of a past year, e.g. if started in 2016, we would ship Year Sets 2015 and 2014, the following Year 2016 and 2013 and so on, guaranteeing the availability of past year sets for the customer as far back as possible. Also for these Bi-directional Standing Orders, the 10% discount applies.